Place soup bones in a large pot with 5 cups of water. Bring to a slow boil over medium heat, then reduce heat to the lowest setting and simmer partially covered for 40 minutes or longer. Simmering over low heat yields a clearer and sweeter soup; spoon off foam occasionally. In the meantime, clean and skin the squid. Leave in whole tubes. Rinse and drain well. Pound the white peppercorns, garlic and cilantro roots/stems with a mortar and pestle to form a well-blended paste. Shell and chop the fresh shrimp finely; mix with the ground pork, garlic-pepper paste and 1 Tbs. of fish sauce. 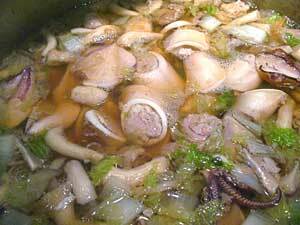 Mix well and stuff loosely into the squid about 3/4 full – do not stuff too tightly as squid shrinks when cooked. Brown the chopped garlic in a little oil in the rounded bottom of a wok. Transfer to a small bowl and let cool. Leave the small caps of oyster mushrooms whole and cut the larger caps into pieces of similar size, using the stems also. If substituting with brown mushrooms, slice into 1/4-inch pieces. Prepare the Napa cabbage (or bok choy or squash), green onions and cilantro. When stock is ready, remove the bones. Flavor broth with preserved Tianjin vegetables, sea salt and fish sauce to the desired saltiness. Bring to a boil over high heat and drop the stuffed squid gently into the hot broth. Return to a boil, then simmer about 5 minutes over low to medium heat. If there's any pork-shrimp mixture left, form into small bite-size balls and drop into the broth along with any squid tentacles. Add the Napa cabbage. Cook another 5 minutes and follow with the mushrooms. Continue to simmer a few minutes more until the vegetables are tender. 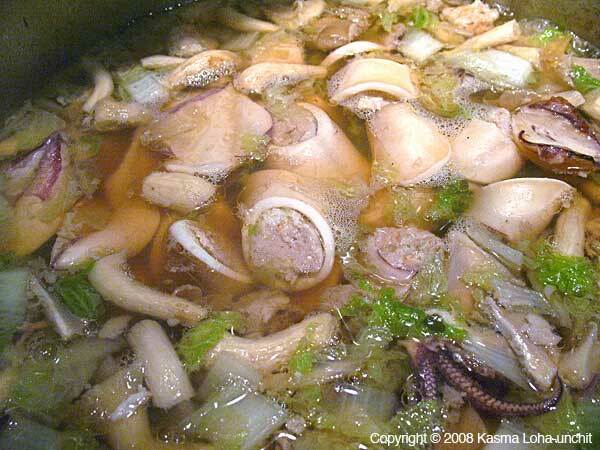 Fish the stuffed squid out from the broth and slice at a slanted angle into 1/2-inch thick ovals. Return to the soup and add the green onions. Just before serving, spoon in the browned garlic pieces with some of the oil and stir in the white pepper and cilantro. Ladle into individual serving bowls. Serves 8 with rice and other dishes in a shared family-style meal. In everyday Thai-style dining, all the non-rice dishes, including soups, are served together with rice rather than as separate courses to be eaten by themselves. During the meal, we take a bite of one dish along with rice, then switch to a bite of a second dish. The third bite might take us back to the first dish, or on to the third or fourth. A small amount enough for just one or two bites is spooned onto our plate at a time rather than piled high along with everything else like in western-style dining. In short, we nibble eat, sharing the dishes with others dining with us, all the while making sure each and everyone gets enough of the extra special dishes in the meal. Soups are often dished onto small, individual bowls placed alongside our dinner plates. We take a spoonful, then continue with our nibble-eating of other dishes and rice, returning to take another spoonful from time to time. Non-spicy soups like this one serve as a palate-cleanser, perhaps subduing the burning sensations on the tongue and lips or clearing the way for us to taste (see Cooking to Taste) the full range of subtle flavors in other delicately balanced dishes. 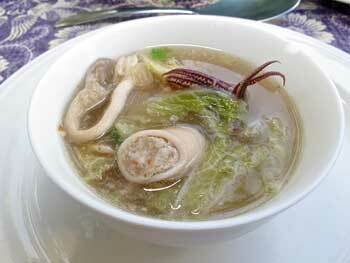 This mild and appetizing soup is sweet with the natural flavors from the seafood, pork and vegetables. The squid shrink to about half their size when the filling in them is cooked, so take care not to over-stuff as the filling shrinks less. When simmered as long as in this recipe, they will be tender in a different way than when blanched quickly for a salad, while at the same time, adding a flavor of the sea to the broth. Large squid are easier to stuff than smaller ones, especially for big western hands unaccustomed to intricate tasks. It would help if their openings were large enough for small spoonfuls of filling to comfortable fit in. 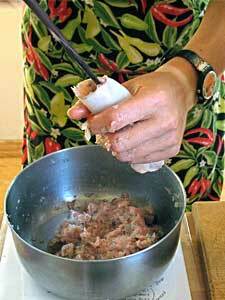 Or, try a sausage stuffing funnel or a pastry bag with a wide open tip. Napa cabbage really adds a lot to the broth. I like to simmer until the pieces are tender and almost feel like they would melt in the mouth, not like the crispness I prefer in stir-fries with this vegetable. Sometimes, I also add a small package of softened, glassy bean thread noodles to the soup for textural interest and extra bulk. They cook quickly so stir in during the last couple of minutes of cooking. Kasma teaches this recipe in the Evening Series Advanced Set E-4. *Because the Thai language has its own script, there are different ways of transliterating Thai into English. The more phonetic version is Gkaeng Cheud Bplah Meu Yad Sai; the more usual spelling is Kaeng Jeud Pla Meuk Yad Sai. See A Note on Thai Pronunciation and Spelling. Recipe Copyright © 2000 Kasma Loha-unchit in Dancing Shrimp. All rights reserved.